The train comes from Knottingley depot just beyond the station, where it has been stabled for about fifteen minutes after coming into Knottingley as the 14.19 from Castleford (starting at Leeds). Knottingley station is the terminus of most trains from Leeds and Wakefield, though some trains do go onto Goole and Hull from here. 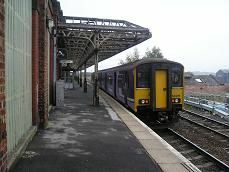 The station has two platforms with the usual maroon framed perspex shelters and there are two freight only lines which pass the south side of the station, coming up from Doncaster. I am the only person on the train apart from the guard who checks my ticket as soon as the train starts its journey. We go into a cutting straight away and then onto an embankment with views of Ferry Bridge Power Station on the right, covered in low cloud. A line goes off to the right towards Ferry Bridge, whilst another passes under us and then one joins us on the right as we go under the M62 and A1(M) motorways, running parallel here. Much of the scenery is old coal waste tips, which have been flattened and landscaped, but you can still see a black tinge to the green grass. We then go into a low cutting and emerge to see some houses on the right. It's a semi-rural scene with fields and houses combined in equal measure. Two coal trains going east pass our train in quick succession. We go onto an embankment again and see houses below us and then we arrive at Pontefract Monkhill station. Two people get on. It has identical maroon framed perspex shelters. There is lots of overgrown shrubbery by the trackside here and then the line to Castleford goes off on the right. We go along another embankment with an old coal spoil heap on the right, with a large factory on the left. We then come into Pontefract Tanshelf, which has the usual maroon framed perspex shelters on both platforms. About twenty students are waiting to get on, but not everyone does get on the train. There is now woodland on both sides of the track and then we go into a cutting for about a mile. At the other end we see mainly bungalows on the right and terraced houses on the left. Then we arrive at Featherstone, which again has the identical shelters, though this time it is split platform station, cut in half by a level crossing. There are large industrial units on the right and a chemical factory on the left as we only go about 20 mph. There is evidence that it was once four tracks wide here. We then come out to open fields on he right and terraced houses on the left. Then you get new housing on the right. We then stop at Streethouse, which has the usual maroon framed shelters. We go over a level crossing and then pass another new housing estate on the left. Then we go into a cutting. We emerge to rolling hills on the right and woodland on the left. Two tracks go of to the right. We then go onto an embankment as a line joins us on the left. We go into a low cutting and then a single track joins us from the left and we reach the outskirts of Wakefield. We go past the rugby league ground on the left, then housing and woodland on the right, with some old sidings. We go over the river Calder. There is another chemical works on left and a water treatment works on right. We pass old sidings, which are now overgrown and a double track goes off to the right, then the line from Castleford joins us and we come into Wakefield Kirkgate station. It is a large station, but has been neglected in recent years and is unstaffed.